The Tripp Lite NetCommander USB Server Interface Unit (SIU) connects to the HD15 port and USB port on a computer/server, and converts them to a single RJ45 connector. Ordinary Cat5e patch cables can then be used to connect the server to the switch ports on a Tripp Lite B070 / B072-Series NetCommander Cat5 KVM switch. Use of Cat5e cables frees up space in the installation that would ordinarily be filled by traditional, thicker KVM cables. Compliant with the Federal Trade Agreements Act (TAA) for GSA Schedule purchases. Get maximum distance and convenience out of your network installation while saving money with Tripp Lite’s B078-101-USB-1 Server Interface Unit for Tripp Lite B070/B072-Series NetCommander® KVM Switches. The B078-101-USB-1 connects to a server’s USB and HD15 ports and converts them to a single Cat5e/6 cable output, allowing the server to connect to one of Tripp Lite’s B070/B072-Series KVM switches. By using Cat5e/6 cable, the B078-101-USB-1 eliminates the need for bulky KVM cables, providing greater flexibility and the distance necessary for cable runs. The unit allows up to 100 ft. between your server and KVM switch and features a compact, lightweight design, which saves space and de-clutters your network application. With no software or external power supply needed, the B078-101-USB-1 is completely plug-and-play out of the box for easy installation and quick application deployment. For peace of mind, the B078-101-USB-1 comes backed by a three-year warranty and has an eco-friendly, RoHS-compliant design. 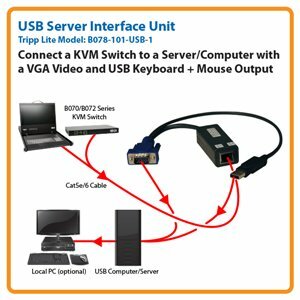 With Tripp Lite’s B078-101-USB-1, traditional KVM cables are a thing of the past. By using cost-effective Cat5e/6 cabling, the B078-101-USB-1 frees up space in your server cabinet and allows for increased ventilation, longer cable runs and greater savings. This server interface unit is needed to connect a USB server to Tripp Lite’s B070/B072-Series KVM switches. Using Cat5e/6 cabling allows your server to be located up to 100 ft. away from the KVM switch that controls it. By eliminating bulkier KVM cables, the B078-101-USB-1 allows cabling to run through conduit and other tight spaces, guaranteeing maximum flexibility when setting up your network application. With the B078-101-USB-1, there is no software or external power needed. Plug the USB and HD15 connectors into the server to be controlled, run the Cat5e/6 cabling to your KVM and you’re ready to go. The unit connects a server or computer with an HD15 connector for video and USB-type connectors for mouse and keyboard control to a KVM switch with Cat5e/6 (RJ45) connectors. The B078-101-USB-1’s compact, lightweight design allows for flexibility when connecting it to a server or computer. The unit’s form factor allows it to fit in tight spaces and free up space where traditional KVM cabling might limit ventilation and accessibility. The B078-101-USB-1 comes backed by a three-year warranty and is manufactured in compliance with strict RoHS specifications, reflecting Tripp Lite’s commitment to environmental responsibility.